We may come from an empire of sand, but make no mistake, we are not a force to be underestimated. What you call civilization, we call a mirage. Your civilization is a carefully crafted illusion, one we intend to dispel. For we come to reclaim what is rightfully ours, which your ancestors stole from us. Let us be clear in that we bear you no hatred or malice, but neither do we hesitate or show mercy. If you stand before our inevitable advance, if you do not flee our unstoppable army, then we will destroy you. Our crusade is righteous, and our swords are blessed by our holy priests. We shall crush your armies as one might crush a carpet of insects. With our holy blades will shall once again take this world to create an empire that rivals our ancient glory! There is not a warrior out there who could not benefit from the might and style of this Khepri Arm of the Scarab God Sword. It is a blade with complex character, having been made for a warrior who wants to include a touch of mysticism in his arsenal. It has a distinctive and unique look, combining the traditional style of a long sword with an ornate and magical looking hilt, making it the perfect choice for any swordsman who wants a blade with magical power. It also serves nicely in the hands of desert dwellers, who might closely align themselves with the blades backstory or its powerful style. 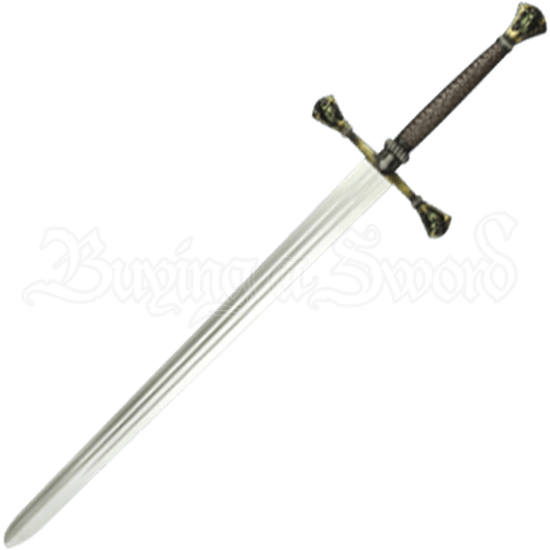 Born out of collaboration between Calimacil and Atelier FantasticArt, this longsword unites the mysticism of North African legends with a classic Crusades era longsword. The union is a stunning one that works quite nicely, as the LARP blade features a golden hued pommel and cross guard, while also featuring detailed green scarab designs on its three tips. The hilt features an intricate looking pattern that simulates woven leather, while the broad blade serves perfectly to make this weapon as deadly looking as any real sword. In this blade, two cultures combine to form a formidable weapon that will assuredly become a favorite in any warriors arsenal. The Khepri Arm of the Scarab God Sword is tested and balanced for combat, as well as being made to high specifications. This sword is not your typical ultra-light foam-latex weapon, but rather, is made using a special injection-mold process that provides immense strength and durability, as well as amazing levels of detail. It is crafted using Calimacils ultra-durable foam, while also featuring a fiberglass core that provides a level of strength that is difficult to contend with. The quality level of construction this LARP sword possesses allows it to provide a virtually maintenance-free experience, while also ensuring that it performs well in every season, whether you are gaming in the spring, the summer, the fall, the winter, the rain, the snow, the sun, and beyond. 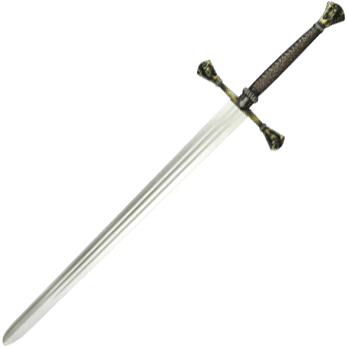 Performance and appearance come together in this LARP sword to provide an experience that cannot be beaten!